The establishment media and the scientific dictatorship are promoting brain-eating vaccines that virtually lobotomize people and rewire their minds into a state of subservient compliance so that their natural instinct to get angry and rebel against the tyranny being imposed upon them is neutered and sterilized. “Academics say they are close to developing the first vaccine for stress — a single jab that would help us relax without slowing down,” reports the Daily Mail. Dr Robert Sapolsky, professor of neuroscience at Stanford University in California, says the vaccine is intended to impose a state of “focused calm” by altering brain chemistry. The proposals ominously hark back to George Lucas’ 1971 dystopian chiller TXH 1138, in which the population is controlled and subjugated through the use of special drugs to suppress emotion. Feeling stress, getting angry, expressing emotion and displaying passion are all innate, natural and vital aspects of human behavior. Reacting with stress to dangerous or uncomfortable situations is an essential and healthy response, and is one shared by just about every living thing on the planet. Scientists are now telling us that getting angry, upset and passionate is abnormal and needs to be “treated” through a fresh dose of pharmaceutical drugs and injections that will virtually lobotomize us into submissive compliance. This is blatantly a part of the full spectrum assault on our minds, our bodies and our nervous system through the contamination of our food and water supply. The new research on brain-altering vaccines dovetails with proposals to add lithium to the water supply in order to treat “mood disorders”. People globally are already being bombarded with sodium fluoride, a cancer causing neurotoxin, through the water supply, toothpaste, and many foods. The first occurrence of fluoridated drinking water on Earth was found in Germany’s Nazi prison camps. The Gestapo had little concern about fluoride’s supposed effect on children’s teeth; their alleged reason for mass-medicating water with sodium fluoride was to sterilize humans and force the people in their concentration camps into calm submission. As a growing number of people worldwide begin to educate themselves about what they are putting in their bodies and how they are under chemical and biological attack from the foods they eat, the establishment in getting increasingly desperate in trying to maintain a sick and weak populace, even telling them that injecting the toxic poison mercury into their bloodstream will be beneficial to their health. Infowars is promoting a new viral Google search term in order to attract much needed attention to this grave issue. Search for “brain eating vaccines” and by elevating this term to the top of Google Trends, we can reach millions of new people who would otherwise have never come across this information. Alex Jones Tv Sunday Edition: When Will You Stand Up and Say Enough is Enough? Elena Kagan has been sworn in, airport body scanners take center stage in national politicial debate, Fidel Castro gave a stern nuclear warning, Billionairs are signing agreements to donate half of their fortunes, and more. Alex also covers the latest news and takes your calls. For those of you who still refuse to believe that the fluoride that is being put in the water is poisonous. Read this. Product Name: Sodium fluoride Catalog Codes: SLS2260, SLS3682 CAS#: 7681-49-4 RTECS: WB0350010 TSCA: TSCA 8(b) inventory: Sodium fluoride CI#: Not available. Toxicological Data on Ingredients: Sodium fluoride: ORAL (LD50): Acute: 52 mg/kg [Rat]. 57 mg/kg [Mouse]. Hazardous in case of skin contact (irritant), of eye contact (irritant, corrosive), of ingestion, of inhalation. Slightly hazardous in case of skin contact (corrosive). Severe over-exposure can result in death. to the substance can produce target organs damage. Repeated exposure to a highly toxic material may produce general deterioration of health by an accumulation in one or many human organs. Check for and remove any contact lenses. In case of contact, immediately flush eyes with plenty of water for at least 15 minutes. Cold water may be used. Get medical attention immediately. In case of contact, immediately flush skin with plenty of water for at least 15 minutes while removing contaminated clothing and shoes. Cover the irritated skin with an emollient. Cold water may be used.Wash clothing before reuse. Thoroughly clean shoes before reuse. Get medical attention immediately. Wash with a disinfectant soap and cover the contaminated skin with an anti-bacterial cream. Seek immediate medical attention. If inhaled, remove to fresh air. If not breathing, give artificial respiration. If breathing is difficult, give oxygen. Get medical attention. Evacuate the victim to a safe area as soon as possible. Loosen tight clothing such as a collar, tie, belt or waistband. If breathing is difficult, administer oxygen. If the victim is not breathing, perform mouth-to-mouth resuscitation. Seek medical attention. If swallowed, do not induce vomiting unless directed to do so by medical personnel. Never give anything by mouth to an unconscious person. Loosen tight clothing such as a collar, tie, belt or waistband. Get medical attention immediately. Flammability of the Product: Non-flammable. Auto-Ignition Temperature: Not applicable. Flash Points: Not applicable. Flammable Limits: Not applicable. Products of Combustion: Not available. Fire Hazards in Presence of Various Substances: Not applicable. Risks of explosion of the product in presence of static discharge: Not available. Slightly explosive in presence of heat. Non- explosive in presence of shocks. Small Spill: Use appropriate tools to put the spilled solid in a convenient waste disposal container. Poisonous solid. Stop leak if without risk. Do not get water inside container. Do not touch spilled material. Use water spray to reduce vapors. Prevent entry into sewers, basements or confined areas; dike if needed. Call for assistance on disposal. Be careful that the product is not present at a concentration level above TLV. Check TLV on the MSDS and with local authorities. Do not ingest. Do not breathe dust. In case of insufficient ventilation, wear suitable respiratory equipment. If ingested, seek medical advice immediately and show the container or the label. Avoid contact with skin and eyes. Keep away from incompatibles such as oxidizing agents, metals, acids, alkalis. Storage: Keep container tightly closed. Keep container in a cool, well-ventilated area. Use process enclosures, local exhaust ventilation, or other engineering controls to keep airborne levels below recommended exposure limits. If user operations generate dust, fume or mist, use ventilation to keep exposure to airborne contaminants below the exposure limit. Splash goggles. Lab coat. Dust respirator. Be sure to use an approved/certified respirator or equivalent. Gloves. Splash goggles. Full suit. Dust respirator. Boots. Gloves. A self contained breathing apparatus should be used to avoid inhalation of the product. Suggested protective clothing might not be sufficient; consult a specialist BEFORE handling this product. TWA: 2.5 (mg/m3) from NIOSH Consult local authorities for acceptable exposure limits. Color: White. pH (1% soln/water): Not available. Boiling Point: 1704°C (3099.2°F) Melting Point: 993°C (1819.4°F) Critical Temperature: Not available. Specific Gravity: 2.78 (Water = 1) Vapor Pressure: Not applicable. Vapor Density: Not available. Volatility: Not available. Odor Threshold: Not available. Water/Oil Dist. Coeff. : Not available. Ionicity (in Water): Not available. Dispersion Properties: See solubility in water. Soluble in cold water, hot water. Solubility in water: 5g/100 ml @ 100 deg. C, 4.3 g/100 @ 25 deg C, 4.0 g/100 ml @ 15 deg. C. Very slighly soluble in alcohol. Stability: The product is stable. Instability Temperature: Not available. Conditions of Instability: Incompatible materials, dust generation, excess heat Incompatibility with various substances: Reactive with oxidizing agents, metals, acids, alkalis. Corrosivity: Not available. Contact with metals may evolve flammable hydrogen gas. Sodium reacts with acids to form hydrogen fluoride. Alkali fluorides (except lithium salt) absorb Sodium Fluoride to form acid fluorides. Special Remarks on Corrosivity: Not available. Polymerization: Will not occur. Routes of Entry: Inhalation. Ingestion. Toxicity to Animals: Acute oral toxicity (LD50): 52 mg/kg [Rat]. CARCINOGENIC EFFECTS: A4 (Not classifiable for human or animal.) by ACGIH, 3 (Not classifiable for human.) by IARC. MUTAGENIC EFFECTS: Mutagenic for mammalian somatic cells. Mutagenic for bacteria and/or yeast. May cause damage to the following organs: kidneys, lungs, the nervous system, heart, gastrointestinal tract, cardiovascular system, bones, teeth. Hazardous in case of skin contact (irritant), of eye contact (corrosive), of ingestion, of inhalation. Slightly hazardous in case of skin contact (corrosive). May cause adverse reproductive effects (fertililty, fetoxicity), and birth defects based on animal data. May cause cancer based on animal data. May cause genetic (mutagenic) and tumorigenic effects. of long bone cortices, calcificaiton of ligaments, osteomalacia, osteosclerosis (skeletal (bone and teeth) abnormalties) and mottled tooth enamel. Other symptoms may include anemia, nausea, vomiting, diarrhea or constipation, kidney damage and weight loss/anorexia. Chronic inhalation may cause bronchitis to develop with cough, phlegm, and/or shortness of breath. , liver (hepatic enzymes increased, jaundice), . Ecotoxicity: Not available. BOD5 and COD: Not available. Possibly hazardous short term degradation products are not likely. However, long term degradation products may arise. Toxicity of the Products of Biodegradation: The products of degradation are less toxic than the product itself. Special Remarks on the Products of Biodegradation: Not available. OSHA: Hazardous by definition of Hazard Communication Standard (29 CFR 1910.1200). EINECS: This product is on the European Inventory of Existing Commercial Chemical Substances. CLASS D-1B: Material causing immediate and serious toxic effects (TOXIC). CLASS D-2B: Material causing other toxic effects (TOXIC). R25- Toxic if swallowed. R32- Contact with acids liberates very toxic gas. R36/38- Irritating to eyes and skin. S22- Do not breathe dust. S36- Wear suitable protective clothing. S45- In case of accident or if you feel unwell, seek medical advice immediately (show the label where possible). Waste must be disposed of in accordance with federal, state and local environmental control regulations. DOT Classification: CLASS 6.1: Poisonous material. Identification: : Sodium fluoride UNNA: 1690 PG: III Special Provisions for Transport: Not available. Gloves. Lab coat. Dust respirator. Be sure to use an approved/certified respirator or equivalent. Wear appropriate respirator when ventilation is inadequate. Splash goggles. The information above is believed to be accurate and represents the best information currently available to us. However, we make no warranty of merchantability or any other warranty, express or implied, with respect to such information, and we assume no liability resulting from its use. Users should make their own investigations to determine the suitability of the information for their particular purposes. In no event shall ScienceLab.com be liable for any claims, losses, or damages of any third party or for lost profits or any special, indirect, incidental, consequential or exemplary damages, howsoever arising, even if ScienceLab.com has been advised of the possibility of such damages. The establishment has gone from denying they are involved in aerosol spraying to admitting it. Alex calls for activists to send their video clips for a documentary exposing this criminal behavior. 1) Is the Commission aware that, since 1999, members of the public in Canada and the USA have been complaining about the growing presence in the air of aircraft condensation trails of a new type, which sometimes persist for hours and which spread far more widely than in the past, creating milky veils which are dubbed ‘aerial obscuration’, and that the new type has particularly come to people’s attention because it is so different from the short, pencil-thin white contrails which have been a familiar sight ever since jet engines came into use and which remain visible for 20 minutes at most and can only be produced if steam condenses on dust particles due to low temperatures and high humidity? 2) Is the Commission aware that investigations by these complainants, observations by pilots and statements by government bodies increasingly suggest that what is happening is that aircraft are emitting into dry air small particles consisting of barium, aluminium and iron, a phenomenon which in public debate in America has come to be known as chemtrails? During the thorough coverage of H.R.3590 America thought it was free of a ‘Healthcare System’ that allowed a national medical registry to be created and the population to be tagged with implantable RFID chips. But a second heath care related bill called “The Reconciliation Act of 2010” (2300 pages) was recently passed by the Senate on March 25th after being passed by the House on March 21st. This bill has been cleared for the White House and awaits the signature of the Dictator and Chief. Buried in the text of the 2300 page monstrosity in section 2521, the creation of a National Medical Device Registry is enacted. This is portrayed as a registry to collect safety data on medical devices such as pacemakers and to put the safety data in a publicly accessible national electronic database. Forget the national ID card, implantable microchips are coming to a clinic near you no later than 36 months after the bill is signed into law. So basically this bill creates a National Database of any type of data deemed appropriate by the executive branch of the US Federal Government. This could literally be anything. This could include anything you might have expected to find in an East German Stasi file. All of this data will then be linked to a “Class II implantable device” under your skin. There you have it, just like Lindsey Williams warned us. 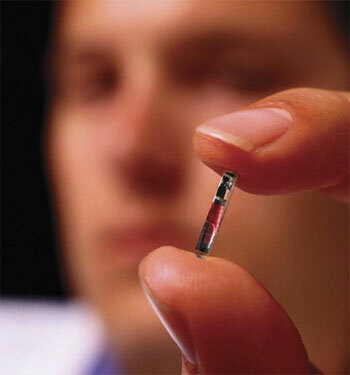 Forget the national ID card, implantable microchips are coming to a clinic near you no later than 36 months after the bill is signed into law.